Usually, people are looking for laptops with screens of 15inches because this size is suitable for watching movies, editing photos or browsing the internet. But these laptops are heavier, especially if their exterior is made of metal, and you won’t see many users carrying them on the street, in a bag. Of course, a car comes in handy, but not everyone has a driving license or money to buy a vehicle. So, we’re back to the proper size of a laptop, to make it easy to carry. In this case, you’ll need a mini laptop, which you will use as a host for your documents, projects, important data that you will take with you at your workplace. Instead of copying these files to a memory stick or sending them via email, just leave them on your laptop’s hard drive and carry the device with you, show them to your friends or collaborators. Another advantage is that you can modify these files in real time. 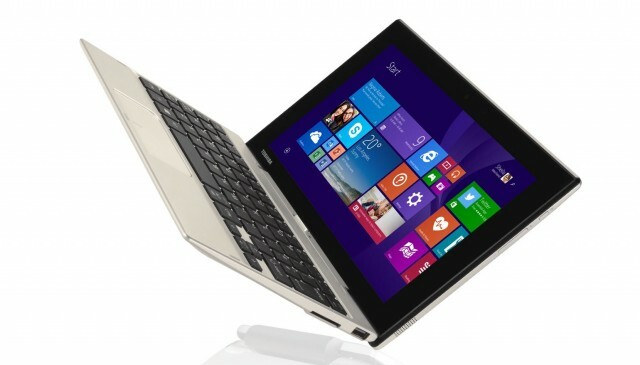 Anyway, we’ll cut to the chase and introduce you the Toshiba Satellite Click Mini laptop with an 8.9inches display. What’s interesting about this device is that it has a detachable tablet whose LED-Backlit LCD screen supports a resolution of 1920 x 1200pixels, making it a laptop/touchpad hybrid like the Surface 3, but with a reduced size. The Satellite Click Mini has two batteries, it runs on Windows 8.1 OS (from July 29 it will be compatible with Windows 10) and its price is £199 ($305) on Amazon, with free delivery in the UK. If you’ll want to buy an alternative to Satellite Click Mini, we recommend you the Dell Venue 11 Pro 7000, whose price is more than double, or the Transformer Book T100 Chi, which costs around $600. The Surface 3, which is also sold on Amazon, costs less than $500 and you’ll need to buy a type cover priced at $130. So, the Satellite Click Mini is much more affordable and has everything you need in the package. Besides, you’ll get a year-long free subscription for Microsoft Office 365, and after the trial ends, you’ll decide whether to extend the subscription or not. Its body is made of plastic and has a chunky feel. It measures 235x161x9.8 mm, but when you attach the keyboard, it appears much solid because it has one battery behind the display and the other battery hides under the detachable keyboard, so then it will have a thickness of 19.9mm. Also, without the keyboard, the Satellite Click Mini weights 472grams and with this accessory, the weight doubles. When charging the device, you’ll notice that the display will get warm on the left side, but if you’re not using it in tablet-mode, then you won’t feel any difference. You won’t like the bezels because they’re a bit thick, but you’ll like the idea to have two memory card slots – the microSD on the right side of the tablet and the SD slot in the base. The microUSB connector can be used as a charging port like on the Android smartphones, but it has compatibility problems, because it doesn’t supports all charges. The base has an USB 2.0 port and not 3.0 (budget compromise). There is a speaker on each side of the screen, but the sound is not that loud. Don’t attach an external speaker, because the EU warning will pop up, but you can fix this by installing a generic audio driver. The Toshiba Satellite Click Mini is powered by a an Intel Atom Z3735F processor clocked at 1.33GHz, which benefits from Burst Technology 2.0 and Intel HD Graphics. The device houses 2GB DDR3 of SDRAM and 32GB eMMC Flash Memory, but as we said, you can expand its capacity. In terms of connectivity, the device supports Wireless LAN 802.11b/g/n (with a download speed of up to 150 Mbps) and it has two sensors: 3D Acceleration and Compass. Several performance tests were performed, to get an opinion about Satellite Click Mini’s capabilities. In the 3DMark: Cloud Gate test, it scored 1145; in the Sky Diver test it scored 452 and in the Fire Strike test it crashed. It seems that in the Cinebench CPU test, it didn’t want to run in 32bit mode; in the PCMark 8 Home Test – the Conventional mode, it obtained 1004 points and in the PCMark 8 Battery Life test – in Conventional mode, having both batteries, it had a lifespan of seven hours and 34 minutes. Toshiba didn’t focus on this laptop’s camera software and equipped the Satellite Click Mini with a 5MP camera on the back with autofocus, while the front webcam has a resolution of 2MP. It seems that from time to time, the internet stops working and the device disconnects and reconnects to the network, which is kind of annoying when you’re in the middle of a download, or if you’re surfing the web.